Since 12 January 2015 Bürkert has been preparing for the scheduled construction of the fluid technology specialist’s new buildings at the Criesbach location. 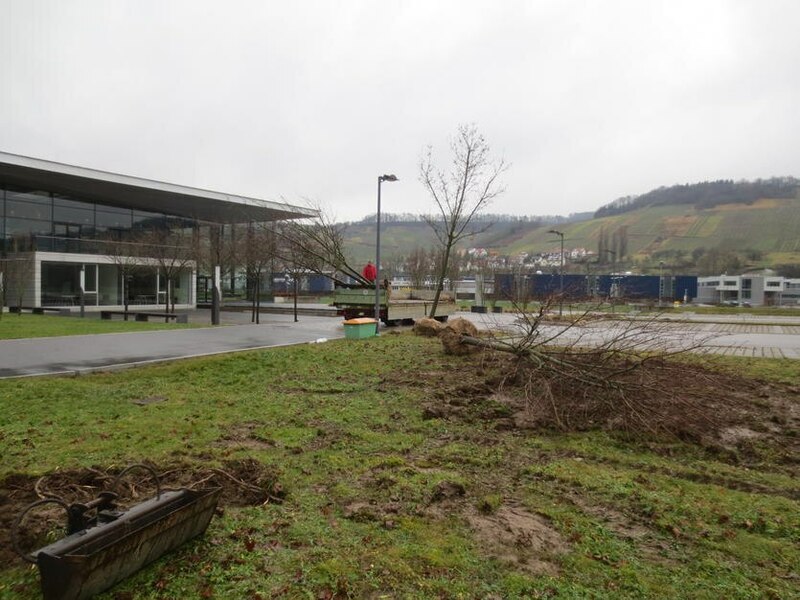 One of the first measures is the renaturation of the existing parking lot in front of the Systemhaus. This involved recently digging up a stock of valuable trees for interim storage at another location. The trees will be transplanted for landscaping of the new parking lot in April or May 2015, depending on when the lot is completed. Another preparatory measure is the construction of a storm sewer through the city of Ingelfingen, starting at the eastern end of the building plot and extending to the Kocher River. This measure necessitates closing of the Keltenstraße between the city of Ingelfingen and the Systemhaus for about eight weeks. With an expected completion date by the end of 2016 the new buildings in the vicinity of the Systemhaus will include a production building with office space, a training centre, a company restaurant, a parking garage and an 18-metre high bay warehouse. The ground-breaking ceremony for the 30 million euro project will take place in March 2015, weather permitting.